Cherelle Cunningham shares Birmingham Museum & Art Gallery’s experience of using Periscope to engage the widest possible audience. Gain tips for getting started with live streaming. We wanted to explore new ways of reaching the widest possible audiences for Birmingham Museum & Art Gallery. I was planning the marketing campaign for our I Want! I Want! : Art & Technology exhibition and it seemed fitting to experiment with digital engagement. My colleague Jon from our Learning team had been thinking about live streaming for a while so we teamed up to make it happen. We aimed to overcome barriers to seeing the exhibition and raise the profile of the Museum and Art Gallery to attract more physical visitors. While we wanted to reach the widest possible audience we also had two specific target groups in mind: young people and people over the age of 75. We arranged a planning session and Jon and I looked at which elements of the exhibition might suit different audiences. We focused on the pieces relating to particular themes. Jon was able to answer live questions around the theme, while presenting the artwork itself. The next step was to test the technology. We needed to check the picture quality and identify whether there were weak wifi spots that we needed to avoid in the gallery. We used an iPad to film and live stream via Periscope — a live video streaming app. Birmingham Museum & Art Gallery already had an established Twitter following and the staff involved all had Twitter accounts that could be linked as admins to Periscope. Periscope allows you to live stream just to admins so we did several test runs before going public. For the over 75 age group, we knew that physically getting to the Museum and Art Gallery could be a barrier to engaging with the exhibition. For this audience, live streaming was a way of taking the experience to them. We live streamed the exhibition directly into a care home. Jon sat with residents showing the live stream on an iPad while a Museum Enabler filmed the exhibition on a mobile phone. We kept the live stream private so it was more like a video call, which meant that residents could control the tour. If they didn’t like a piece Jon would tell the Museum Enabler to move on or return to a piece they liked. It was their experience. Some of the residents weren’t able to communicate verbally so Jon observed how they responded. We focused particularly on visually engaging pieces that really stimulated the senses. The feedback from the care home was positive. Giving residents control of the tour also enabled us to learn about what the group were most interested in. That will help inform the content of future tours. I Want! I Want! 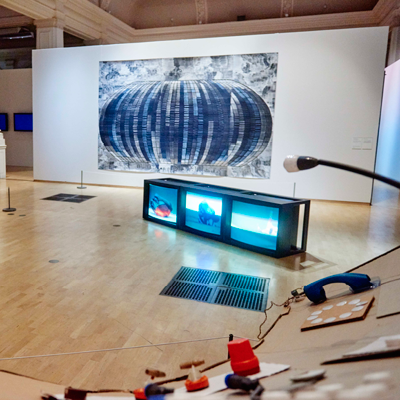 : Art & Technology is an Arts Council Collection National Partners Programme exhibition.